The Gravenstein apple has long been sought after by chefs for its culinary uses and its elegant balance of sweet and tart flavors. Their dense texture makes them perfect for sauces and pastries, and the best apple crisp imaginable. It also makes the best cider around. 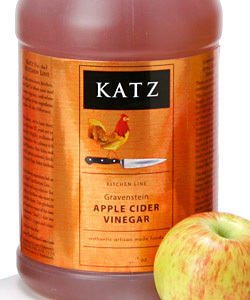 Here is where our efforts come in…we take this hard cider made from late ripening Gravenstein apples when the sugars are high, and then the cider is carefully and slowly converted to vinegar in our 55 gallon oak barrels.